Most sleep experts agree that buying an appropriate mattress is one of the largest and most important financial investments you can make in your sleep, but when it comes to improving the quality and quantity of your sleep, a good pillow is almost as important as a good mattress. It helps keep your neck and head in the proper alignment with the rest of your body and therefore supports a healthy sleep posture crucial for achieving a comfortable and sound night’s sleep and waking without pain and stiffness, and you just have to pick the right one that will best work for you. In today’s review, we’ll take a look at the Nectar pillow created by the Nectar mattress company and designed to match the quality and adaptive feel of their mattress (click here to read the full Nectar mattress review). It is available for purchase either with or separate from the Nectar mattress, and further in this review, you’ll learn more about its construction and benefits. You can order the Nectar pillow directly from the company’s website. It comes compressed in a plastic package and expands into its shape immediately after you open it. There is not much smell/off-gassing coming from it which is pretty surprising given its all foam construction and the fact that it comes wrapped in a plastic package. This pillow is designed to be adjustable in overall volume and height while retaining a memory foam material construction. It is stuffed with three types of visco-elastic shredded memory foam, and it perfectly contours to your head and neck. The pieces of memory foam vary in size, and they are protected by the inner pocket of the pillow. This means that you can customize the loft of your pillow to achieve optimal comfort by adding or removing the filling which is something we especially like about the Nectar and other adjustable pillows in general. The Nectar pillow has a quilted Tencel cover which gives it a unique look and feel and matches the design of the Nectar mattress. We like that the cover is made of Tencel as it is softer and more breathable than cotton. Tencel is also known to be one of the most environmentally friendly materials present on today’s market. It is comfortable against the skin, wicks away heat and works together with shredded foam to promote the circulation of air through the pillow and prevent the build-up of heat and the feeling of stickiness usually present with many other memory foam pillows. The cover is removable and washable which means that you can easily take it off by using the zipper and wash it if it gets dirty. The company recommends using mild soap and water, patting gently the pillow, squeezing the water out and letting it dry naturally without using a washer or dryer. On the first sight, we thought this pillow looked too thick. Initially, it put our necks at a steep angle and did not seem so comfortable, but after removing some of its filling, we adjusted its loft to our liking, and now we think it’s perfect. It doesn’t sag and offers better support than other memory foam products. It is supportive to keep your head and neck in proper alignment with the rest of your body while it is also soft enough to prevent the appearance of pressure points and provide a comfortable night’s sleep. As the Nectar pillow is designed to be fully customizable and adaptive, it is suitable for all sleep positions and body types. You just need to remove or add the right amount of foam to make it work for you, and you can save the remaining filling and always add more foam if your preferences change. Unlike many other pillows we have slept on so far, this one does not cause any pain or discomfort in our upper backs or neck. We feel our heads and necks are well supported throughout the night without feeling like we are sleeping on something too firm and stiff. The Nectar pillow also sleeps significantly cooler than other pillows due to its shredded foam construction, the use of gel-infused memory foam, and Tencel cover known for its cooling and moisture wicking properties and breathability. Therefore, it does not cause the buildup of heat and the feeling of stickiness typical for memory foam products which can make your head get too warm in the night and cause excessive sweating. So, this pillow has everything that is necessary to keep you cool and comfortable throughout the entire night and help you get enough of sound and quality night’s sleep necessary to wake up feeling refreshed, relaxed and totally ready to start the new day. The Nectar pillow comes in at a fraction of the prices of the in-store memory foam pillows and costs only $75 which is an extremely reasonable price given its high quality and extraordinary design. Although the company offers no sleep trial period for the pillow, it offers a 90-day refund policy on unopened product and a 30-day refund if the pillow has been opened which gives you enough time to try out the pillow, see if it suits you, and make sure there are no defects. Click here for the best price on the Nectar pillow. Is the Nectar Pillow Right for You? Customizable, high-quality pillows – Most pillows are just one flat piece of foam, or they are filled with feather or shredded poly foam and don’t allow any kind of customization. The Nectar pillow, on the other hand, is a fully customizable pillow stuffed with the highest-quality foams which you can add or remove to achieve the level of comfort and support you need. Cool-sleeping pillows – The Nectar pillow incorporates several technologies in its design to keep you cool, from a quilted memory foam cover, breathable and gel-infused foams inside it, to a moisture-wicking Tencel. Therefore, it is an ideal option for all those looking for a pillow that can provide them with a cool and comfortable sleep throughout the entire night. Memory foam feel – This pillow provides contouring and hug typical for memory foam, and it is soft enough to prevent the appearance of pressure points without causing you to feel trapped in foam. If you are looking for a new pillow, you should definitely consider purchasing the Nectar pillow. Being made of three different types of premium foam, it is far more supportive than traditional pillows and suitable for all sleeping styles. It is adjustable in that it allows you to remove or add back its filling to achieve the softness that will best work for you. 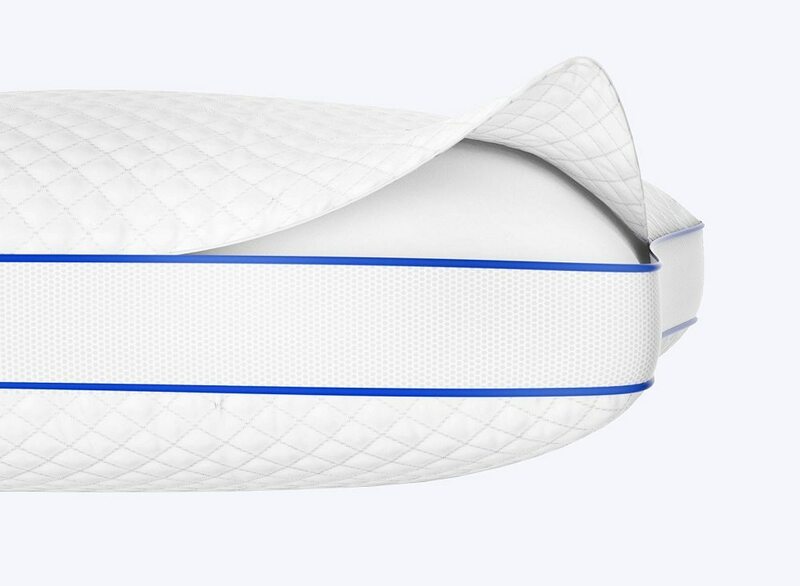 It offers enough support to keep your neck and head in proper alignment with the rest of your body and enough softness and comfort to prevent the appearance of pressure points and provide a continuous and restful night’s sleep. So, if you are looking for an adjustable highest-quality pillow, the Nectar is definitely an option worth looking at.